We are stronger than we think, mama. We will make it through this. The diagnosis is scary, but that's not all we have. Let's give our children a tight hug right now -- smell their skin and feel their weight in our arms. Let's close our eyes and hold on to this peace -- this love. 1. Coping looks different for everybody. How you react to a diagnosis may not be how someone else will react; neither of you are wrong. For example, I want to talk and share with anyone who will listen and I often just blurt things out as a way to process what's happening and formulate an idea. My husband, on the other hand, internalizes what's happening. He does not like to talk about anything until he has had time to fully think through his ideas and fears. We have different ways of dealing with and talking about the diagnosis and that is ok.
2. It's OK to get mad/sad, but don't let those negative feelings take over. It's easy for me to become a ticking time-bomb filled with anxiety, stress, and worry. So, I've started a new strategy: When I start to feel sad or mad, I set a timer for 10 minutes. Then I give myself permission to wallow in that feeling or wander through all of the "what-ifs." After the 10 minutes is up, I tell myself it's time to move on and I don't allow myself to get sucked into the negative anymore. Giving myself a set-aside time each day to worry prevents me from worrying all.the.time. 3. Google is not our friend, but it doesn't have to be our enemy, either. The Internet is a good place for information and support. It's also a good place for fear and discouragement. Everyone's story is different, so I found plenty of articles and blog posts that made me feel better or worse, depending on the day, about my son's outcome. I learned to be selective about the research I do on the internet. Right after my son's brain tumor diagnosis, I joined a bunch of online support groups -- this was not a good idea. After being bombarded by worst case scenarios I finally decided to leave most of those groups. Since then, I have found an online support group for parents of kids with my son's specific diagnosis that is mostly positive and supportive and that's what I need right now. 4. Try to focus on the space between thoughts (and practice other anxiety-relieving techniques). 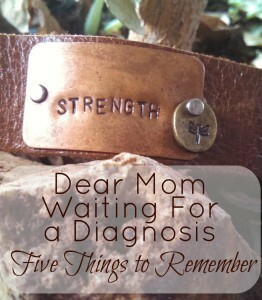 Anxiety is the real kick-in-the-pants when your child is facing a serious medical diagnosis. I learned a technique when my mom was diagnosed with cancer and it helped me immensely. I try to focus on the space between thoughts. This means I purposefully look for the quiet space in my mind. When I first started doing this, I grasped at thin air -- there were no quiet spaces! With practice, I've been able to slow down my thoughts enough so I can tell where one ends and another starts -- this helps me stop the cycle of anxiety and calm down. 5. Hope is a very powerful thing. Truthfully, it's easy for me to wonder if we used up all of our luck. My son was given only a 4 percent chance of healthy survival when he was born prematurely at 23 weeks gestation. The type of tumor my son has accounts for only 2 percent of brain tumors -- it's rare. We've been on both sides of the statistics so far. And that is where hope comes in. I have no idea what the future holds -- nobody does. So, I choose hope for a positive outcome. And for me, that hope comes in the form of a smile and belly laugh from my son. We are stronger than we think, mama. We will make it through this. The diagnosis is scary, but that's not all we have. Let's give our children a tight hug right now -- smell their skin and feel their weight in our arms. Let's close our eyes and hold on to this peace -- this love. It's what makes all the scary days worth it. Visit An Early Start to follow the journey of our micro-preemie born at 23 weeks gestation. A version of this post first appeared on Preemie Babies 101.